Premium brand Hudson Baby infant clothes are an attractive and stylish way to dress your precious little one. This is made up of 100% combed cotton. These garments are soft to the touch on your baby’s skin. All Hudson Baby pieces come with design variations based upon the Sweet Baby artwork theme This makes a great baby shower gift. This is available in sizes from newborn up to 9 months. Homasy 100ML Essential Oil Diffuser with Lonizer Color Changing Light — Lowest Price! *HOT* Learning Resources Pretend & Play Animal Hospital, BEST price! Promote music appreciation and auditory development by introducing your little one to baby-friendly versions of classical masterpieces by Mozart, Vivaldi, Chopin and Rossini with the Baby Einstein¿ Takealong Tunes! A large, easy to press button allows your baby to toggle through 7 high quality and enjoyable classical melodies at home, or for on-the-go fun! 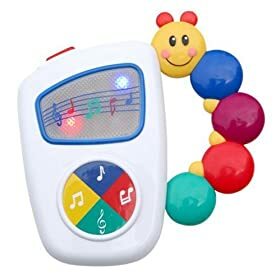 This baby¿s version of an ¿MP3 player¿ has colorful lights that dance across the screen to enhance each entertaining melody and promote visual perception. K’NEX Classics 4 Wheel Drive Truck, 313 Pieces $9.99 (reg. $27.99), BEST Price!